Decades ago my family would go to my grandparent’s beach house in Ocean Park. We didn’t go often but, when we did, we’d have dinner at The Ark which was technically in Nahcotta, WA. I remember climbing on the mounds of oyster shells with my sister, Lori, and our friend, Shani McEneny, or our brother, Gary. Honestly, I don’t remember what I ate when I was that young…just the oyster shell mountains and that we went there because my folks liked nice restaurants and The Ark fit the bill. Fast forward many years later and my sister and I spent a New Year’s weekend at Grandpa’s beach house and had The Ark’s famed Scotch Salmon. One writer’s description is “Scotch Salmon comes lightly pan fried, deglazed with Scotch and orange juice, laced with Drambuie and garnished with crème fraiche and orange zest.” Confident in my husband’s cooking abilities, my sister encouraged me to buy their cookbook so my husband would make it for us someday. That evening was a little prophetic for lack of a more appropriate word. **For the original recipe, go to http://www.foodbanter.com/general-cooking/2688-speaking-grand-marnier-how.html. Several years later my sister was visiting from California and my husband did make that dish for her. A few years after that, my sister moved to the Long Beach Peninsula and became friends with the creator of that dish…Jimella Lucas. Sadly, Jimella passed on from cancer last November but much has been written about her culinary accomplishments, love of community and heart for children. My niece was one such recipient of that kindness, having performed at Jimella and Nanci’s Market Café in Klipsan on a few occasions. The real Scotch Salmon is amazing but a bit pricey to make since it does call for Scotch and Drambuie; two ingredients we do not keep on hand. So, my husband came up with a version that, while it won’t be raved about by James Beard, works for a Tuesday night when we just want something a little different. 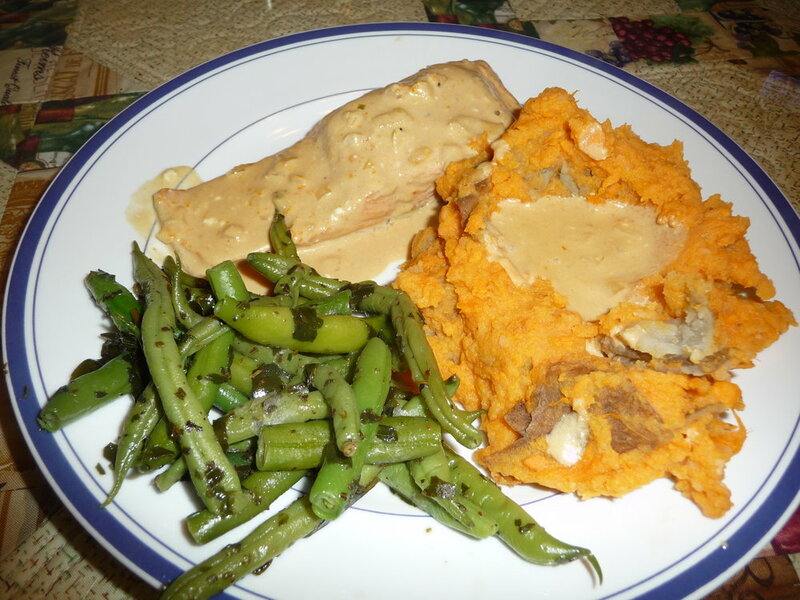 The other night we rounded it out with Italian Green Beans and Mashed White/Sweet Potatoes. He poured some of the salmon cream sauce over the potatoes. It’s not a low cal meal but it sure hit the spot! Melt butter in large skillet. Saute garlic and onion for 2-3 minutes. Add salmon fillets (skin side down) and saute additional 2 minutes. Add brown sugar, Dijon mustard, and orange zest. Saute and shake pan in a circular motion occasionally for 4-5 minutes on medium-medium high heat. Turn salmon and deglaze the pan with scotch or sherry and balsamic vinegar. Add cream. Allow dish to simmer at medium heat until salmon is cooked to individual doneness and sauce has thickened to personal preference (10-15 min depending on thickness of salmon). Serves 2. Preheat the oven to 375F. On a sheet of heavy-duty foil (about 18x15”), place frozen beans, rest of ingredients and 1 Tbsp water. Close foil tightly to prevent leakage; place on cookie sheet. Steam in oven 40 minutes. Serve beans in their liquid. Make 3-4 servings. Boil potatoes for 15-20 minutes. Drain water. In same pot, add the rest of the ingredients and mash with hand-held potato masher (my favorite way) or put all ingredients in a mixer and mix until incorporated. Serves 4-6.